So, years and years ago, I used to read the many book reviews Will Duquette wrote at a blog called The View from the Foothills. Will had a way of getting at the heart of a book; the total antithesis of the sort of review where someone writes “I loved/liked/hated this book” and then goes on for a thousand words and yet you know no more about the book after reading that review than before. Over time Will’s interests changed, as happens, and his blog shifted much more toward posts about religion and software, and I stopped checking in so regularly. 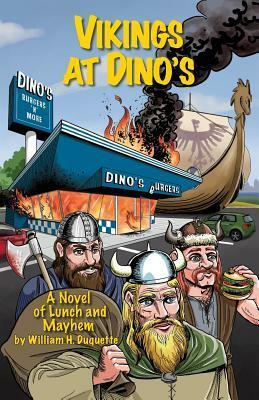 But eventually it occurred to me to see if he might be on Facebook, which he is, and thus I learned that Will had written a book called Vikings at Dinos: A Novel of Lunch and Mayhem – I learned this because he posted about getting a proof of the sequel. So I picked up Vikings, and the other day when I was stuck in a hotel room for a long evening, that’s the one I opened up. It turned out to be a good choice. When the Viking war party burst through the front entrance of Dino’s Burgers & More, it was second nature for me to slide quietly under my table. When you’re small for your age, it’s often useful not to be noticed. Once on the floor I waited on events, peering out as best I could past the swivel seats and wondering what was going to happen. Vikings are not a usual sight at Dino’s. The Vikings kill some customers and burn down Dino’s, stomp out, board their longship (which is balanced on its keel in the parking lot) and vanish. Things go on like that for some days, with first Vikings and then a Roman legion and then lots and lots of Mongols on little ponies appearing and sometimes disappearing (but more often sticking around to wreak bloody mayhem on the town). Which may be arguable, but is definitely a great line. There are quite a few nice lines in Vikings, which is a time-travel romp with underlying serious notes. Michael is a great protagonist. That “When you’re small for your age” tagline reappears in different forms; you can chart Michael’s character arc by that line as he becomes much less solitary and much more open to the world. Michael’s father, it turns out, was a Traveler, a person born with the ability to step easily from one parallel world to another. He passed that ability on to Michael; thus the story that unfolds in Vikings. Unfortunately, Michael’s father was also a “sad, lonely, friendless man;” Michael never knew him, but he basically tried to make sure Michael would be cut off from most ordinary human society too (because he thought a Traveler was more likely to survive that way, evidently). We don’t meet the father in this book, though I wouldn’t be surprised if we do in the sequel. Family relationships are important in Vikings, especially Michael’s relationship with his mother. The foundation is also laid for a possible romance. I liked Michael a lot, especially as he discovers that quite a few people in the town are actually friends, or would like to be, a startling revelation to a guy who has been something of a recluse. I don’t remember encountering a person who is “small for his age” as a protagonist before. Wait, yes I do: Bee in Fool’s Assassin by Robin Hobb is very tiny and she does take the pov from time to time, but various things about that book annoyed me so much that I could not possibly appreciate Bee. Also, that’s a slooow-paced secondary world epic fantasy, offering a totally different reading experience than a contemporary time-traveling fantasy like Vikings. Anyway, Michael was believable and likable. He’s competent, but not unbelievably uber-competent; and a decent guy without being exactly nice. I liked Michael’s mother, though she didn’t seem quite as believable; and Bernie (named after St Bernadette), who learns better than to be quite so quick to leap to unfortunate conclusions as she was at first. There are quite a few minor characters that round out the cast, and I liked them too, especially the police chief. This is a short novel and even though the protagonist is in his twenties, I’m pretty sure it would work well for a YA audience as well as for adult readers. It’s fast-paced and the plotting is tight, with just a few loose ends left hanging for the sequel; plus Michael’s character arc is pretty much a YA type of arc as he moves from solitary to engaged with his community. If you enjoy stories that involve time travel, and if you have a kid from twelve on up who also likes time travel stories, I’d expect you’d both get into this one. I don’t much care for time travel myself, as a rule, but I liked Vikings, partly because it’s actually parallel-universe hopping and some pretty weird worlds are thrown in there for contrast. There’s a pretty horrifying dead world that we see several times, among others. The style is light; it’s funny without being heavy-handed about the humor. It’s quick and fun to read, but not too quick or too fun or too quirky – there’s a limit to how light I like my SFF, and this doesn’t go over that line, so I really enjoyed it. The narrative is first-person, where the protagonist’s voice makes all the difference, and here the overall style suits Michael perfectly. The underlying themes about family and community add depth, also without being at all heavy-handed. I’m pretty sure this book was self-published, so I’ll add that it’s practically error-free. I noticed two minor her-and-I type errors, but this is the kind of thing that might just happen in ordinary dialogue because in conversation people do sometimes say “I” when they mean “me.” I noticed just one actual typo, which is pretty impressive considering how VERY difficult it is to get rid of Every Single Typo, as I am once again finding out as I move toward the release of Shadow Twin. Definitely recommended, and I’ll be keeping an eye out for the sequel, which I believe will be called Very Truly Run After. I’m reading the latest David Weber book in hard back (because they’re not offering it on Kindle yet), and I’ve been astonished at how bad the copy editing is. Just as an example, character names are frequently underlined. I am mystified as to how that made it past the proofs. I’ve picked up a copy of Duquette’s book, on your recommendation, and also because I also checked in on his blog once upon a time. It does sound fun. Any interest in a chocolate cookie recipe with 2-1/4 cups chocolate to 1 cup flour? It’s almost like Tunnel of Fudge cake, but as a cookie. Allan, seriously? Character names are … underlined? It’s not that I don’t believe you, it’s just … really? If I were Weber, I would be livid. I can’t think of a single reason names would ever be underlined, but it’s even harder to imagine why they’d be left that way. Elaine, absolutely — drop that recipe in the comments to the next post (cupcakes), if you would be so inclined. I know, right? And it’s pretty common. Just flipping the pages here, the text of the book starts on page 3. I see one on page 4, page 6, two on page 8, page 11, and two on page 12. So that’s seven times in the nine pages of the first chapter.